It was the nightclub that became symbolic of the confidence, delusion and eventually disillusionment of the Manchester music scene in the 1980s and early 90s. Now the Haçienda is being used as an industry model in a degree course in popular music. Although it become a world-famous dance and live music club in its heyday, the Haçienda cost a fortune to build and lost hundreds of thousands of pounds for its investors, who were mainly the members of New Order, who watched their record sales royalties disappear nightly. 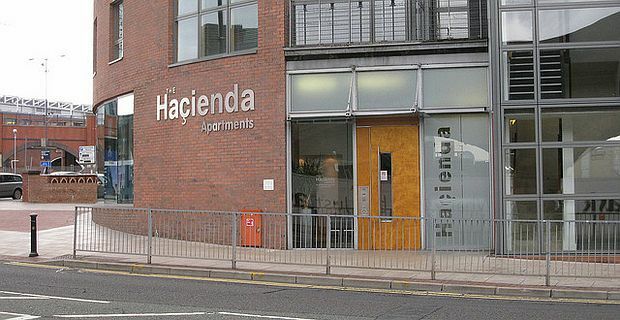 When drugs and guns began to dominate the club scene in the wake of the "Madchester" frenzy sparked by The Stone Roses and Happy Mondays, the Haçienda became the focus of the edgy scene, and was eventually closed down because of the trouble. The building is now a modern apartment complex. The masters course in music industry management and promotion at the University of Central Lancashire has support from former New Order member and Haçienda co-owner Peter Hook. His memoir How Not to Run a Club should be one of the course’s main textbooks. Hook has observed that that it would have made more economic sense for New Order to have handed everyone in the Haçienda queue £10 each and turned them away. Hook at least hopes the next generation of club entrepreneurs can learn from his experience. "I am excited to be involved in a project that's going to offer genuine opportunities to help support the future of the British music industry," he said. He is presently touring a show that plays classic Joy Division songs.